As a nation, we are wired, advanced and wealthy. So surely Singapore can find a better, safer yet financially feasible alternative to transporting humans on the cargo decks of lorries? It is illegal in China and banned in Bahrain. It shocks overseas guests, including migrant workers from around the region who endure this mode of transport daily. Shen, a construction worker from China, says, “When I first arrived at Changi Airport, I was so impressed. Then a goods vehicle came to pick us up. I was shocked and felt very ill-at-ease, why is this company sending a goods vehicle to pick us up?” Construction worker, Yash, says that in India, people take buses (though they may not be luxurious) – if employers transported workers in this way, “the police will come after you and beat you up”. Raj, who has previously worked in Saudi Arabia, says, “I never imagined here in Singapore they will transport us this way. In Saudi, you will never see this, it is not allowed”. The debate about transporting workers in open-deck lorries has been revived since the horrific lorry accident along the Pan-Island Expressway (PIE) last Tuesday morning. The lorry skidded and crashed into a divider, resulting in 3 workers dead, 14 injured (and 1 driver arrested). Just one day later, there was yet another lorry accident, this time involving a 24 foot lorry carrying 40 workers – the lorry crashed into a tree, leaving six workers injured and having to undergo treatment for head injuries. It is estimated that over 200,000 workers are ferried to and from their worksites daily on the cargo decks of lorries. While not a practice exclusive to foreign workers, male migrant labourers in the construction, marine and landscaping industries form the bulk of the passengers who are transported this way on a daily basis, in the searing heat or pouring rain. In 2009, it was reported that an average of four workers a week who are transported on lorries never make it to their destination in one piece. A total of 210 passengers transported in this manner were injured or killed in 2008, a disturbing increase from 69 in 2005. Kadal, also from India, says that sometimes the back of the lorry is not latched properly and it opens up. Zhang, a construction worker, says this is especially hazardous when the lorry is speeding and makes a turn. In the meantime, there is nothing for the men to hold on to unless they are seated at the sides – those in the middle have to simply grab on to their co-workers. Subash, who works in the shipyards, says sometimes drivers fall asleep at the wheel because it is so early in the morning and they do shift work; often the lorry drivers start at 4am and drive non-stop till 10am, so they are fatigued. “When traveling this way,” he says, “you just have to trust that you won’t get hurt, that’s all you can do”. Meanwhile, things get worse when it rains. Ju, a construction worker, says that when it rains, the workers seated at the four corners will hold up a sheet, or else the men use trash bags to shield themselves. For Kadal and his colleagues, there is no cover, even when it rains – the men are left to their devices. Zhang says the inside of the lorries are often dirty with silt and debris. When it rains, the men find themselves not only getting drenched by rainwater but their pants soaked by the murky water that fills up the lorry. By the time they arrive at work, they are not just wet but caked in dirt. According to Zhang, there isn’t even a chance to change their clothes – the men have to get straight to work. Shen, also a construction worker, says that when it rains, the handlebars (if any) are slippery and sometimes the lorry may overturn on wet roads. He laments that it is a miserable experience sitting under the pelting rain, especially if one falls ill after. When workers catch a cold as a result, they may or may not be granted sick leave – if they are, they are often not paid for those days they are resting. Zhang says that in all his years of working here, he has never taken medical leave for the flu. If you rest, he says, you won’t get paid and he “cannot afford not to work”. Other hazards of traveling on the back of goods vehicles include backaches from the prolonged bumpy rides on uneven surfaces and exposure to high heat, wind and dust. When asked why workers are sometimes seen rushing to board lorries, Zhang explains that you need to do that in order to get a “good seat” close to the front. If you sit at the back, he says, the wind is so strong you can’t open your eyes and all sorts of debris flies in. (Kadal once got a severe eye infection after particles flew into his eyes and he could not work for two weeks) Meanwhile, if you sit in the centre, there is nothing to hold on to. Ju explains that this rush – particularly on large worksites – is due to workers anxious not to be left behind if the lorry is full. Waiting for the next ride (or the next) may mean workers, particularly those whose dormitories are situated far away, may not arrive in their dormitories till hours later. Akhtar, a Bangladeshi shipyard worker, says that the limited number of lorries hired by the company for a large number of workers means that he and his colleagues may sometimes not return to their far-flung dormitory till 10pm at night. After cooking their dinner, washing up, showering and doing their laundry, they will head to bed past midnight. Early morning lorry rides suffer from a different problem – Akhtar must wake up at 4am to be in time for a 5am lorry ride that drops him off at the shipyard by 6am, although work only begins at 7.30am. Another construction worker, Devraj, is dropped off at his worksite at 5.30am, while work only begins at 8am. This may explain the sight of sleep-deprived workers dozing off in lorries, dangerous as this practice may seem. Almost all the workers I spoke with complained about speeding, which seriously jeopardizes their safety. Ju says his company’s drivers “don’t care if there is a red light” and sometimes speed off without first checking that all the workers are seated properly or have boarded the lorry. According to Ju, the drivers are paid per trip, so their imperative is to hurry. They tend to drive very early in the morning, to lessen the chances of being caught by authorities. Zhang explains that sometimes drivers rush because they have many different work sites to get to so they need to make multiple trips and ensure workers are not late. The perils of speeding are compounded by overcrowding. Raj says he has seen lorries that are meant to seat 13 hold up to 19 men; those with a capacity of 23 may cram in 30. 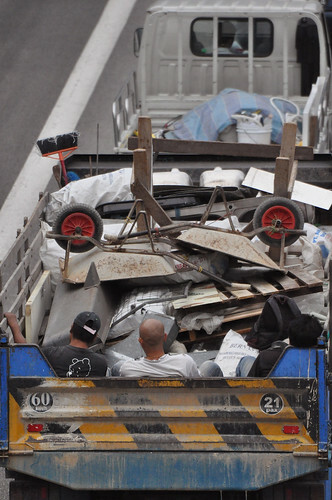 Many of the workers express surprise that they are transported in this manner in Singapore. Says Murugan, “I didn’t expect it when I first came, I thought we would be transported by bus. The first time I had to travel by lorry, I felt quite shocked and embarrassed”. Ju and Zhang express similar sentiments, recalling – like Shen – their ‘welcome ride’ from Changi Airport when they first arrived. “It was so unexpected,” says Zhang, “to see a goods vehicle crammed full with all these men squeezed among their luggage and have to climb inside”. In China, says Zhang, there isn’t this form of transport for people. 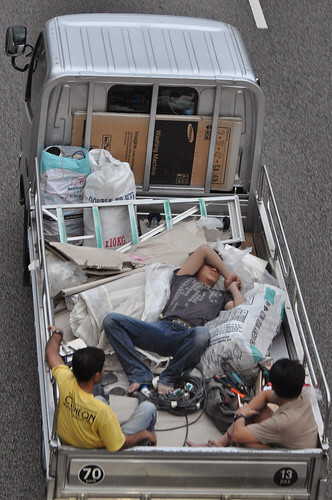 Ju adds, “In China, this is definitely not allowed and people will get fined for transporting workers like this”. When asked if they have raised the hazards of this form of transport with their bosses, Gulzar shakes his head and says, “You cannot tell the company these things. If you say this, you will have lots of problems”. Zhang widens his eyes at this question. “Of course not! No one else has mentioned it so how could you dare bring it up? My boss will tell me, If others can take it, why can’t you? Do you think you are better than them?” Meanwhile, Murugan says that yes, he has complained about this, but the boss said, “If you are not happy, go back to India”. Kadal, similarly, has requested for the lorry to be covered. He was told, “No, if you want you can take the bus. If you cannot take this, don’t work, go back to India”. Shrugs Kadal, ‘What to do? We have to work”. Do safety measures make it safe? After years of debate and a spate of accidents last year, the Land Transport Authority announced new safety measures in August 2009 regarding the transport of workers on lorries. To be phased in over three years, the measures include height restrictions, the installation of side railings and canopies and doubling the minimum deck space per seated worker. At the time, there were questions over why it should take three years to implement these measures, and the accidents last week have renewed calls to expedite this process. But let’s get one thing straight: there is no such thing as “safe travel” on the cargo decks of lorries. While certain control measures – observing speed limits, installing railings, not sitting on unsteady platforms – may mitigate risks, it is still an inherently unsafe practice because these are spaces not designed to carry human passengers. As Dr Joseph Thambiah, head of National University Hospital’s orthopaedic trauma division, has pointed out, “The absence of restraints or seat belts means that those sitting on the cargo deck could still injure themselves if they were flung against each other or thrown to the back of the lorry”. A Business Times commentatory has said of these measures: “While enhancing safety, [they] still do nothing about the fact that commuting unbelted in the back of an open-top truck is simply a fatality waiting to happen”. John Gee, President of Transient Workers Count Too, advocates that “transporting workers in buses should still be the ultimate goal”. Workers from India and China have also mentioned that this is how workers back in their home country are also transported – and Singapore is recognized as a well-resourced city with advanced infrastructure. The workers I spoke with generally rejected “cost-effectiveness” as a sufficient reason to compromise their safety. Kadal insists companies should pay for workers to be transported on buses, where they will be seated safely and sheltered from the rain. If there are accidents, asks Kadal, the employer may look after immediate medical costs, but what about long-term injuries? It was also pointed out that workers transported safely in buses will be happier and more productive. Ju acknowledges it may be cheaper to ferry workers in lorries rather than buses, but says if the company truly cared about safety they would. However, in his experience, workers’ safety is his company’s lowest priority – “where they can save, they will save”. As Gulzar emphasizes, this practice is so pervasive, “the government must take action, we individuals cannot do anything”. Murugan, meanwhile, states it plainly: “We are talking about the cost of a human life – saving money should not be the consideration”. 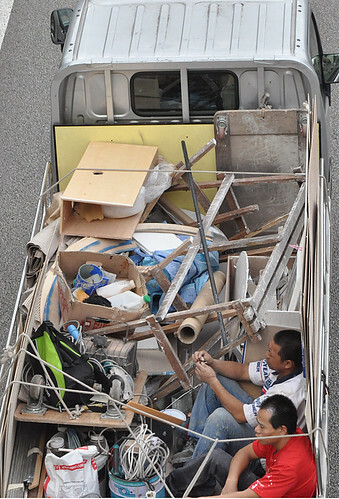 Photographs were taken from an overhead bridge in Toa Payoh overlooking the PIE during the evening rush hour on 24 June 2010, two days after a horrific lorry accident killed 3 men and injured 14 others.